Being a big fan of MasterChef, an Australian cooking television show, I don’t want to skip any episode of it since the show is full of fun and inspirational. 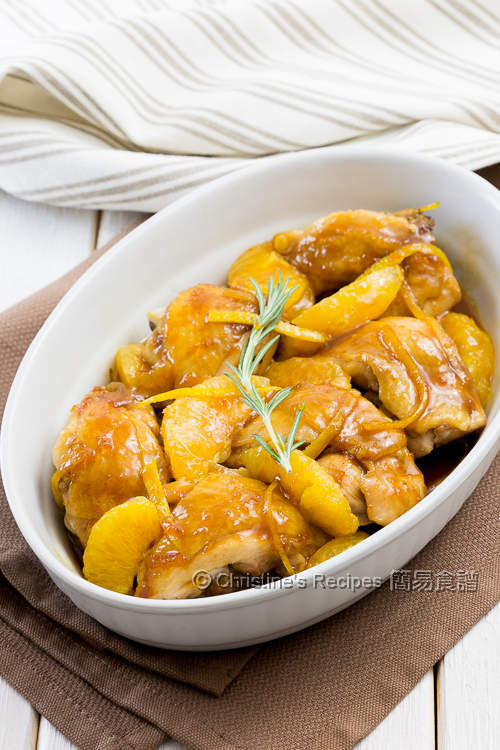 In one episode, the contestants were challenged to create dishes with orange marmalade. All the contestants’ dishes were so attractive and appetizing. I was so intrigued to create one of my own, a home-cook style of course. What I like about orange marmalade are its citrus fragrance and its not-too-sweet taste. It’s great to use in creating a thick sauce. As chicken and orange are good partners. 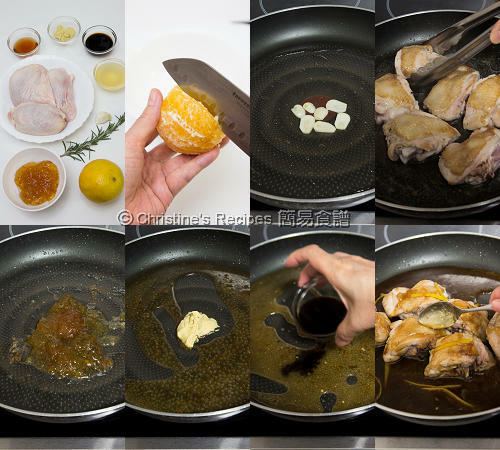 Orange marmalade will definitely go well with chicken meat. How about if I can’t use up a whole bottle of orange marmalade? No worries, it won’t be wasted at all. The leftover orange marmalade can be used on my toast, just like fruit jam, for breakfast. Rinse the chicken thighs and wipe dry with kitchen towels. Season with salt and pepper. Heat oil in a frying pan over medium high heat. Saute the garlic until aromatic and let the oil absorb the aroma of garlic. Drain up the garlic. Set aside. Put the chicken in the pan, with skin side first. Cook for about 5 to 6 minutes and let the oil render out. Flip to another side and cook for 5 to 6 minutes. Set aside with cover. Discard excess oil, just leave about 1 tablespoon of oil in the pan. Add orange marmalade. Cook over medium heat for 1 to 2 minutes. Pour in the red wine vinegar. Combine well. Add the mustard. Stir to combine completely. It needs a bit of patience at this step. A spatula may be a good helper. Add soy sauce, chicken stock and brown sugar. Toss back the garlic and chicken thighs. Pop in the rosemary and orange zest. Cook until the chicken is done. Put in the orange flesh segments. Serve hot. To get the best results, make sure the orange used is sweet. Orange marmalade is available at supermarkets. There are different brands. Some products have more orange peels inside, others less. The one I used doesn't have any orange peels inside. Either one will work as long as you like the taste. If using the one with orange peels, you can skip the orange peels yielded in this recipe then. 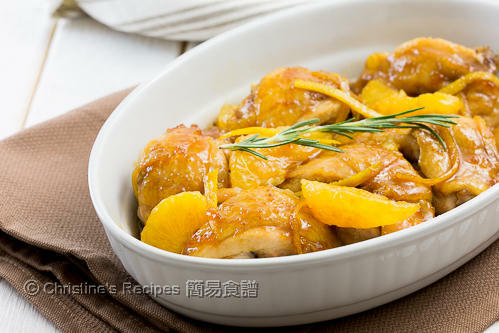 I am not exactly a fan of marmalade, but this looks really tempting and reminds me of plum chicken. Oh plum chicken is good. The marmalade makes this dish unexpectedly tasty.